This is another old nickdisk fanfic that I have decided to transfer onto this site. 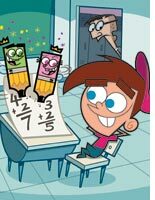 It's an old fanfic of me pretending to be Timmy Turner and writing a the story from his perspective, IOW, through his eyes. This is a fanfic told by me pretending to be Timmy Turner. Just Read and see for yourself. Good Morning everybody, I am Timmy Turner. I just got out of bed this morning. As you all know, I am in my house in Dimsdale, California with my Godparents Cosmo and Wanda. Well they won't go away. I am also with my real parents, Mom and Dad. Let me tell you about my day. Yes I am also wearing my silly pink hat. I got up at 7:00 this morning and got dressed. I brushed my teeth and washed my face. Then I went downstairs for breakfast with Mom and Dad. We had cereal with toast. Then after breakfast, I got on the bus and sat next to my friends Chester and AJ. We kind of had a chit chat. AJ was reading his books so he could gain more Knowledge. Chester was trying to tell jokes. So after that, we got off the bus and proceeded to our class. Along the way, I saw the popular kids. I even saw Trixie Tang. I got love struck and ran right over to her. I talked to her, but she rejected me and walked away from me. I was upset. So then I went to Mr. Croker's room before the bell rang. He gave us a math test. I did the test and gave it to him, but he gave it back to me with an F. I was ticked off when I saw that. Before lunch, the school bully Fransis picked on me, and then on Chester and AJ. We all got upset and tired of it. At lunch I had a turkey and cheese sub and potato chips. Chester and AJ do not want you to know what they had, they said it's none of your business. Their mothers packed bad lunches. So then we went to science class and, well at least we did not have to disect any frogs. That's a relief. Finally, Chester and AJ left and we all went back to our homes. I did my homework. Cosmo and Wanda appeared over me and said "How'd the day go?" "Not too bad" I said. All of a sudden, Vicky came. Mom and Dad left and I was tortured, or however you spell that. She got me doing chores in the house. Boy was I tired of it. SO I said to my godparents "I wish the chores were done" and the chores were already finished. Then at 6:13 I went to the bathroom. After that, I played my video game, not the one where you disapear forever in but some other game. Chester and AJ return to me and play the game with me. We also watch Crash Nebula. Soon Vicky sends Chester and AJ out and me to bed. Chester and AJ say "See you tomorrow" to me. I am in bed now. Mom and Dad also return home to me and Vicky leaves. Well that is my day. Thank you for reading. Goodnite. As you know, that was actually me pretending to be Timmy Turner, so don't be fooled by the fanfic. We all know cartoons do not exsist. For the record, IOW means In Other Words. Stay tuned for more. How to Write like you are your character. First of all, I wrote that fanfic because there is an Arthur episode where you get to be Arthur and see what Arthur sees. I decided to go into Timmy's body and see what he sees and tell from his point of view what is going on. 1. First, choose one character. He can be male or female. He also has to be a nicktoon character if you are posting in this site. Your character does not have to be the same gender as you. Say for instance you are a boy, but you want to be Reggie Rocket, or if you were a girl and you wanted to be Arnold. Well that is fine too. If you're going to be a non nicktoon character, it's recommended you find another fanfic site, unless nicktoons are going to be involved in your story. But just to be safe, find another fanfic site or board. 2. Make sure you know some things about your character before telling your characters story. Know his personality, where he lives, who his friends are, etc. 3. Your story must be in First Person's Point of view. THird Person's point of view will not work if you are pretending to be your character and you are in your story. 4. You must also remember, you are not yourself anymore, you are your character now. You should put who you are, where you are located and what you are doing. Well the location does not really matter much. 5. Be creative with your story. 6. You can also be more than one character, but do one at a time. What I mean by that is, be one character in one story, be another in another. Don't try to be more than one character in the same story. It's highly impossible to do such thing. 7. You can also be your character as many times as you want in other stories too, but try to give other people a chance to be their characters too if they want to use the same character you are pretending to be. 8. Even if somebody else is using a character you want to be, don't hesitate to use that character. I am not holding any rule about if he uses this character, use another one. I won't do that. There is no First Come first serve rule. Even if somebody is pretending to be a character you wanted to be, go ahead but don't plagorize. 9. Don't say "I'm dead" it isn't necessary, just plain stupid, and dead people can not write stories even as a ghost. In fact try to avoid writing stories about your character being murdered, that wouldn't sound very nice. If you write a story like that, I will not read it. 10. (NEW RULE AS OF July 29, 2006) I shouldn't have to tell you not to have your character using bad language, saying offensive things to or about others, or doing anything involving vulgarity. Bathroom use is okay as long as you don't go too into detail. 11. Have Fun being your character(s). (New sentence as of July 29, 2006), if there's anything else I should add, let me know and I'll see about putting it in the list if it's good enough. I think if you do use more then one charector, try having a different chapter for the next one. I'm just bringing this old post to the front page for all to see. I hope I get more readers and repliers. Cool stuff; mind if I move it to the Fanfics board? I kind of asked Superyo to do it but close enough. This fanfic was made before the fanfics forum was created and this fanfic is less than two years old. I guess I'll have to tell him "Never Mind".